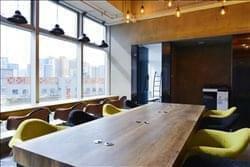 Find My Workspace lists over 95% of the serviced offices & coworking space market in Kwai Chung. Simply click Request Quote to check pricing for one office, or Add to Basket for multiple offices. This stylish co-working space aims to gather young entrepreneurs, small start-ups and freelancers to share ideas and inspire each other. This space will provides a platform that connects everyone with amazing thoughts and ideas together and to create a great feeling in this community. Take advantage of 24-hour access, on-site IT support, comfortable breakout areas and communal kitchens. The reception area will provide somewhere for you to meet and greet your guests, made especially handy thanks to the on-site, multilingual staff, available to help whenever you need it. Choose from private offices or coworking desks, arranged around your needs. Benefit from conference rooms, printing facilities and on-site banking facilities, to make your working day that much easier. If you are looking for a new environment and a new working relationship with others, then this is the place for you! To obtain information for your selected Kwai Chung Serviced Offices & Coworking Space, please tick the "Add to basket" box for each office you prefer and complete the form below. We will then send a detailed report via email.